I was going to begin by saying something akin to "blah blah blah Madison's MobCraft" when I recalled that the brewery has moved to Milwaukee. But being slightly behind the times is par for the course for this review as MobCraft's Helles Ginger Bock came out earlier this spring. In addition, my quaffing occurred a month or so ago. Tempus fugit. MobCraft and I have – not a love/hate relationship – more like an on-again/off-again relationship. I have a great deal of respect for what they do. Polling the teeming millions and then brewing an everything but the kitchen sink beer cannot be easy. But I have found that often times their brews are better in a theoretical kind of way as described on their website than they are when encountered by my tongue. Despite this, there are still times when I'm simply a sucker for novelty, something MobCraft brews up in spades. Helles Ginger Bock appears to have been a brewer's choice as I see no evidence that the style/flavor was crowdsourced from the unwashed masses. In addition to precipitation, procreation, and verdancy ascendant, the spring time is also flush with pale bocks. Spring bocks are lighter in color and a bit more hoppy than the bock biers that help keep the winter at bay. The pungent zestiness of ginger was thought by practitioners of medieval medicine to be hot and wet and so the root is an ideal addition to a spring bock as it can add an aromatic, sanguine complexion to the bier. MobCraft's vernal brew was a lovely golden hue. Its sparkling clarity revealed a surfeit of bubbles tucked underneath an inch or so of off-white foam. The smell was dominated by fresh ginger and its wonderful floral-citrus-pepper pungency. There was a little bit of bread to be had in the background as well. This combination held fast into the taste where that zesty ginger took pride of place. A moderate dose of carbonation and a hint of bready sweetness fooled part of my tongue into thinking it was drinking the ginger beer with which I was down my jerk pork whenever I frequent the Jamerica food cart. Some grassy hops were revealed as the ginger faded on the finish. Bitterness was moderate but the denouement was surprisingly rather dry. Not much Schaumhaftvermoegen to be had aside from a few random foamy spots. 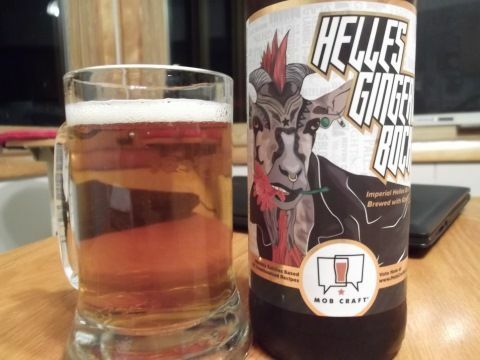 It should be said that Helles Ginger Bock has a great fresh ginger aroma and taste and it truly reminded me of a good ginger soda. To a point. I found this bier to be lacking in the malt department. It was 7.1% A.B.V. but had a fairly light body. There wasn't much bready taste nor malt sweetness. I have no problem with the style's hoppiness being supplanted by the ginger, for the most part, but the paucity of grainy goodness made the bier quite one dimensional. Junk food pairing: Pair any remaining Helles Ginger Bock with a fine, warm processed cheese food sauce. Dip thick cut/kettle chips in the gooey mess to your heart's content.